Every year, many of the country’s top deer biologists, managers and researchers gather together at the Southeast Deer Study Group. Since 1977, these deer meetings have had one main purpose: "To appreciate the economic, aesthetic and biological values of white-tailed deer." These meetings also provide a forum to share research findings, management alternatives and discussion to solve some of our more complicated deer management problems. As always, this year’s meeting did not disappoint anyone. The lust for scientific information on deer is virtually endless and is reflected by the number of "deer-a-holic" hunters who religiously attend these meetings. My friend, Steve Keithley (past President of the Maryland Bowhunters Society) and I agreed that one of the more interesting topics discussed was a paper presented by Mrs. Karen Dasher. Dasher and her fellow researchers from the University of Georgia co-authored a paper on "Scraping Behavior in White-tailed Deer: Back to the Drawing Board". There is probably nothing more satisfying to a hunter than watching a buck make a scrape or walking up on a buck in the early morning darkness and smelling the fresh urine that he has just deposited. There is not a hunter alive who does not look forward to the sight and smell of a freshly made scrape. Yet, with all the hipe concerning scrapes, there are still many unanswered questions from a hunting and biological point of view. At this point, I must admit that although intriguing, hunting over scrapes simply has not been productive for me. In fact, although not a total waste of time, my personal experience hunting over scrapes has resulted in a lot of time wishing I was somewhere else. I’m sure there are many hunters who will totally disagree with me, but I always question, "Was the main reason for your success the scrape or the thousand and one other possible intangibles? 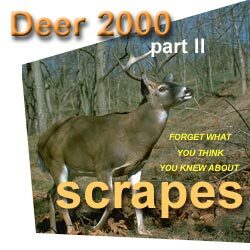 One so-called "fact" that I always believed was that if a dominant buck made a scrape all the inferior bucks in the area would respect his scrape and never dare to deposit any urine or scent. This belief was reinforced many years ago when I saw a dominant buck make a scrape, rub-urinate and mark the over-hanging branch. Later, a yearling buck come by and smelled the freshly raked ground, then exited the area in haste. Because the first buck that I saw was obviously larger, I assumed some specific pheromone from the urine caused the smaller buck to leave the area. The rationale to this scenario is simple, natural selection dictates that the dominant animals will propagate the species. Thus, smaller bucks could be in dire straights if they tried to re-scrape a dominant buck’s scrape. Because this made so much sense, I assumed it was fact until Dasher presented her talk on scraping behaviors. Prior to Dasher’s study, most all scraping behavior studies were conducted in pens or resulted from incidental observations when hunting. A big advance in scraping behaviors occurred when biologists started to use motion or infrared activated 35mm cameras such as products manufactured by TrailMaster and CamTrakker. Although the data the biologists gathered with these products answered a lot of questions, the problem was that they could only look at a single point in time. To solve this problem, Dasher and her fellow researchers mounted a motion-activated video camera next to scrapes and recorded deer behavior. For the first time, we can now observe all the behaviors of deer in and around a scrape area. Out of everything Dasher spoke about, Steve and I found the following quote most interesting, "Subordinate bucks not only rub-urinate in scrapes, but often initiate scrapes, suggesting that previous reports are artifacts of forced associations among penned animals. Our preliminary analysis suggests that while scrapes may be defended by one individual, they are more commonly visited by several bucks." During the talk, Dasher presented a film clip, which clearly showed her results. The film started out with a good buck making a scrape, shortly followed by other smaller bucks re-scraping and rub-urinating in the same scrape. As we sat there and watched the film, I could not help but to compare this behavior with that of dogs urinating against a fire hydrant or telephone pole. Evidently, just like dogs, bucks, whatever the age or social status are always opportunistic when it comes to originating or re-freshening a scrape. In other words, when the big boys are out of the area, any buck may initiate or repaw and urinate into a scrape. I asked Dasher her thoughts on my past experience when I observed a small buck abruptly leave a scrape made by a more-dominant buck. She said, "It’s hard to tell, we know that when subordinate bucks are in the presence of dominant bucks, they will hardly ever initiate or rub-urinate in a scrape. However, once the dominant animal vacates the area, it’s as if the smaller bucks assume a boss-hog attitude and may initiate the whole scraping process." It’s interesting to note, contrary to much of the country that supports a young buck age structure, the area she studied had many older bucks. Pen studies have found that older bucks will actually suppress the scraping and rubbing behaviors of younger bucks. Although not definitive, Dasher’s study may contradict this previous finding. Current research states that dominant bucks do most of the breeding, but because lesser bucks are involved in the scrape process they may also be highly involved. Some researchers have termed these young bucks, satellight breeders. Another interesting finding dealt with the timing of buck visits to a scrape. Dasher found that 90 percent of all visits occurred after legal shooting hours. Other studies support these same findings. Is scrape hunting worth our time? Well, research indicates that if you hunt at night (which is obvious illegal), specifically an hour after sunset and a half-hour prior to daybreak, you stand a good chance of seeing a buck visiting a scrape. Not surprising, Dasher found visitation rates at scrape sites dropped to near zero percent during the rutting time period. She also reported zero visitation at scrape sites after the second week of December, during what some hunters call the second rut. Bucks of all age structures will visit the scrapes of other males and just because a buck makes a scrape, this does not mean he will re-visit. In fact, a number of bucks harvested in Dasher’s study area were never detected at her scrape sites. Is scrape visitation a random occurrence? We simply do not know. Research has found that subordinate bucks are just as likely to initiate and rub-urinate a scrape as long as the dominant buck is not in sight. Visitation of bucks at scrapes generally occur at night, and just because a good buck makes a particular scrape does not mean he is the only one utilizing it. 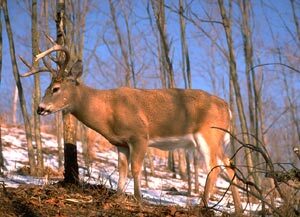 Research has shown all age classes and social status of bucks will initiate scrapes and re-paw existing scrapes. C.J. Winand is a whitetail biologist from Randallstown, MD. He is a staff writer for Bowhunter as well as Deer and Deer Hunting Magazine.